When you wake up in the morning and you have no idea what to eat. And you're absolutely insanely hungry. And you want something that's fast and cheap and delicious. And you just don't know where to go. Worry not! For we have a perfect place for you. 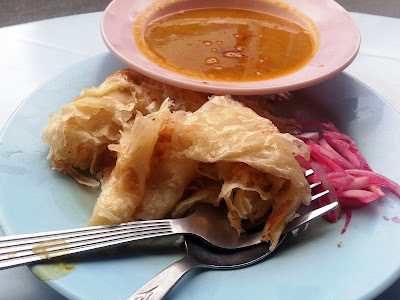 Yes, makan roti canai di Lorong Susu. 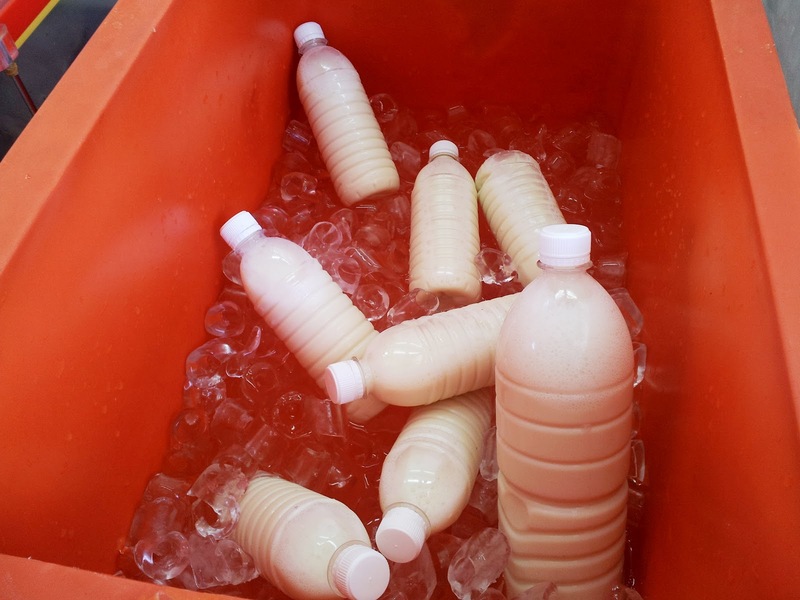 She: I don't think many people will know where Lorong Susu is! He : They will know la. 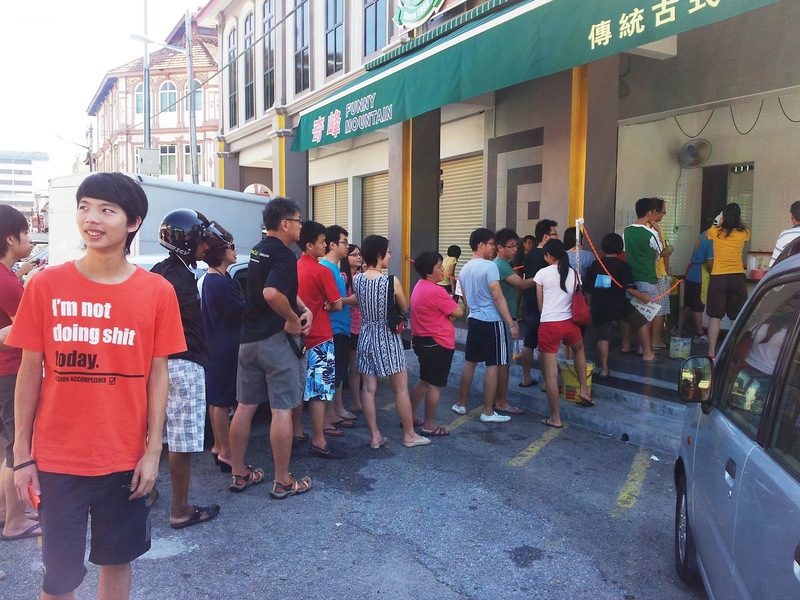 There's famous chicken/duck rice here whatt! He: What not nice? It's super nice okayy! and they will know la. They are not you. 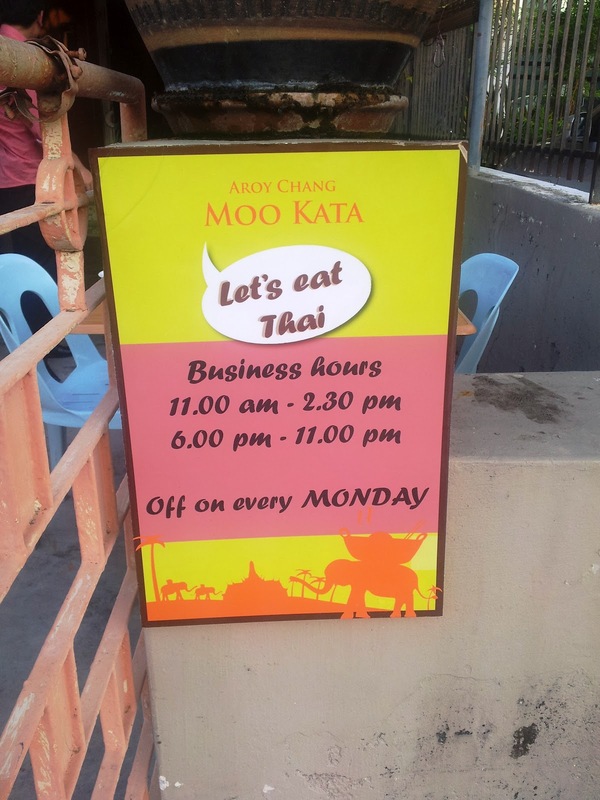 We purposely set our alrm clock earlier so that we could eat at this place and introduce it to you folks. Good things we must share, correct? I shall let the photos do most of the talking. the front part of stall. 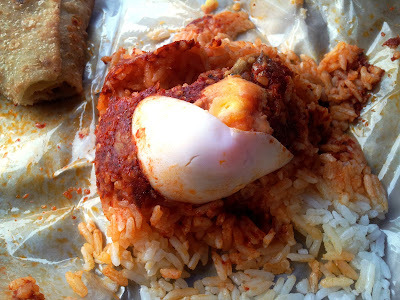 He says: Typical nasi lemak. 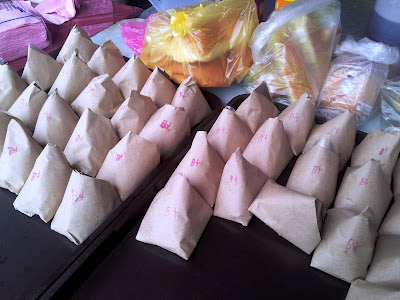 She says: My idea to try the nasi lemak! It's yummy. What's most important of nasi lemak other than the rice is definitely the sambal. 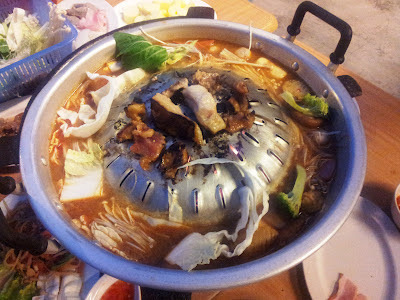 And this one has a great aroma and spicyness in it. Love this! 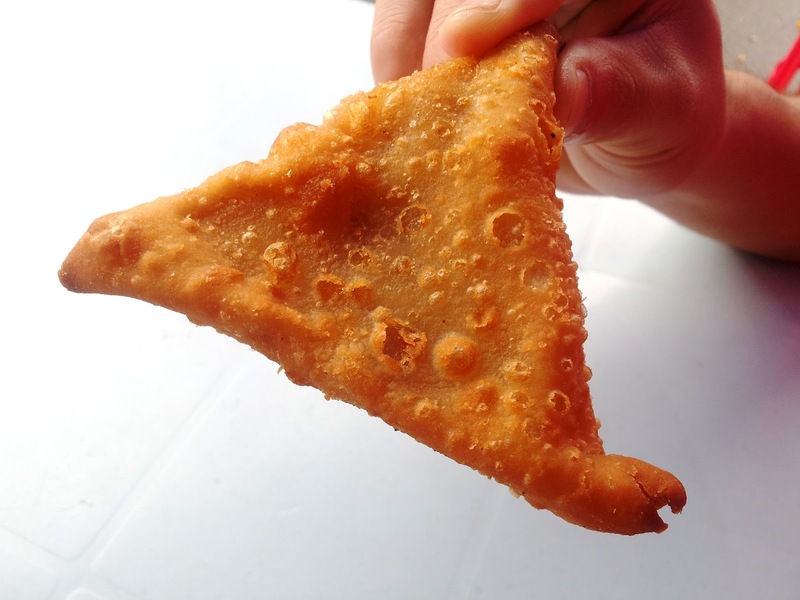 He says: I call this karipap tiga segi! There's sweet potatoes insideeee! 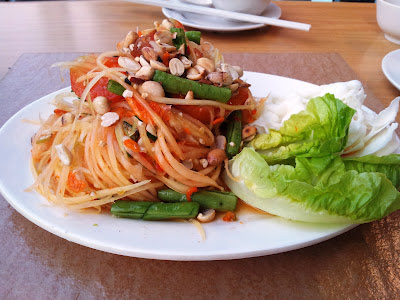 However, its not crispy enough..
She says: According to him, there's sweet potatoes in it. I took a bite and it's just potatoes. And it was cold and chewy. Samosa is only nice when it's hot and crispy. So, this one, a big no-no to me. 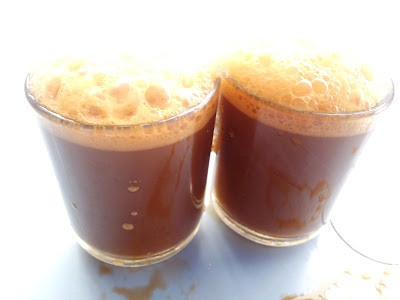 Kopi Tarik (instead of teh tarik) since we needed to be really awake! 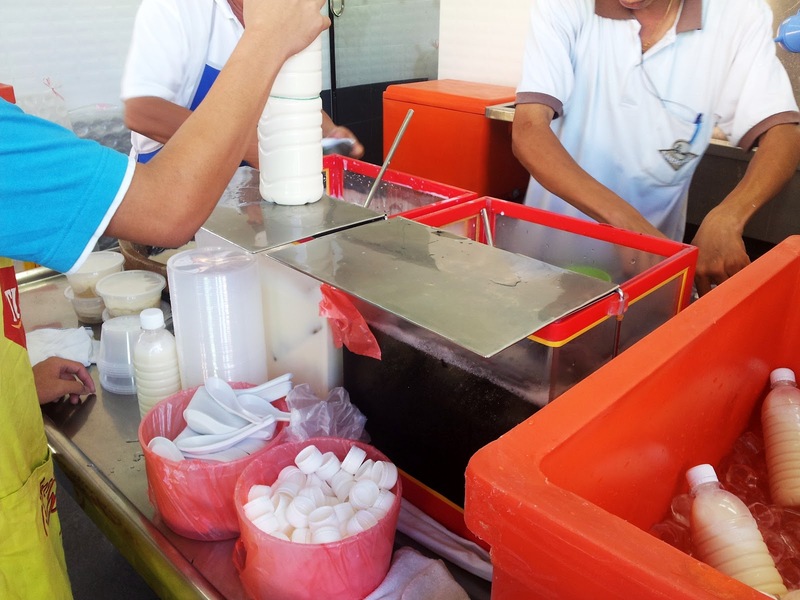 He says: Kopi tarik kuat kuat! Its good! 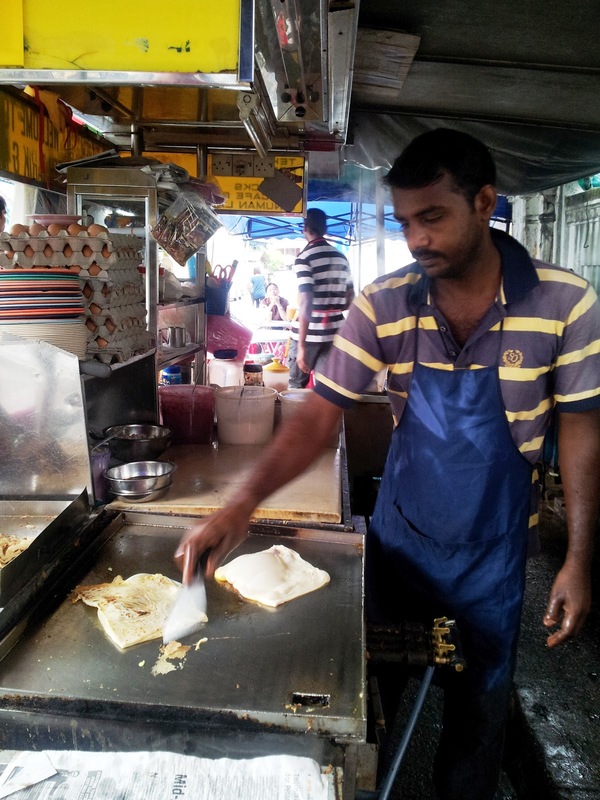 Finally, ROTI CANAI that we've been waiting for! 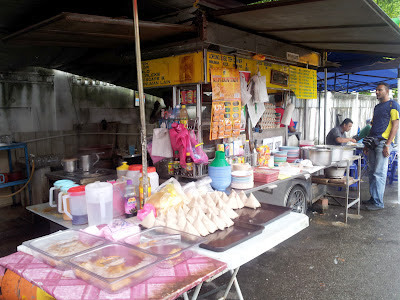 His: roti kosong with separated kuah. She says: I don't eat roti kosong eh. I like it with eggs. Heh. Her: roti telur with kuah. She says: Immediately got chemistry between me and the roti telur drenched with kuah. It's soooo nice! 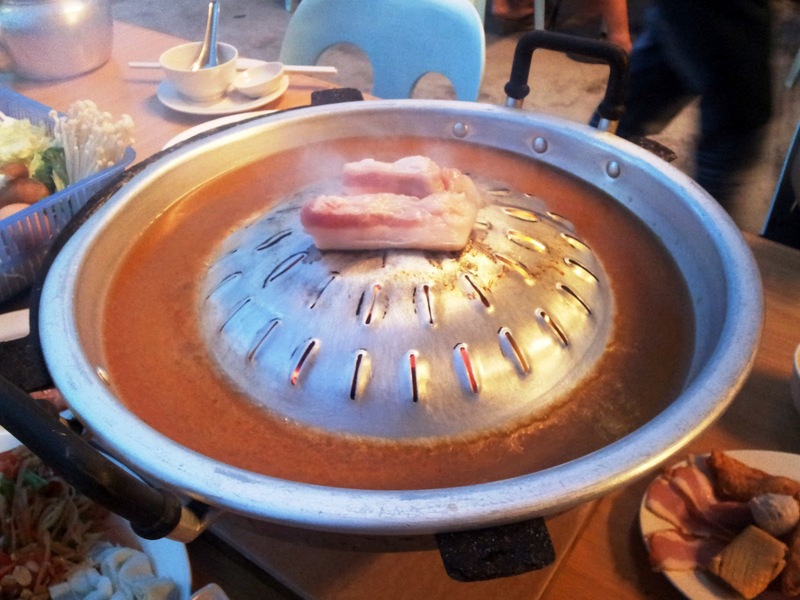 It's not that spicy and eat together with the marinated pink onions, BEST! 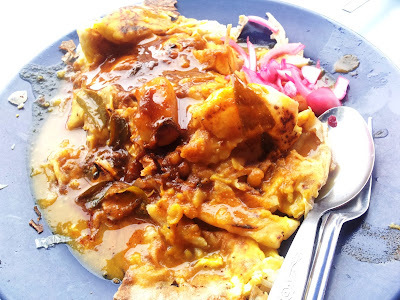 Best roti canai breakfast ever! Location: Lorong Susu, off Macalister Road. 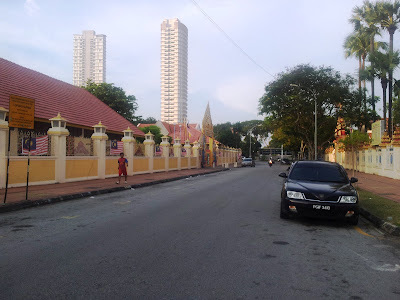 the direction to Lorong Susu. A good friend of ours suggested this place for dinner. A dinner to celebrate the beginning of his new chapter in the university. Big boy liau. Sadly, his new chapter is opened 4 hours away from all of us. 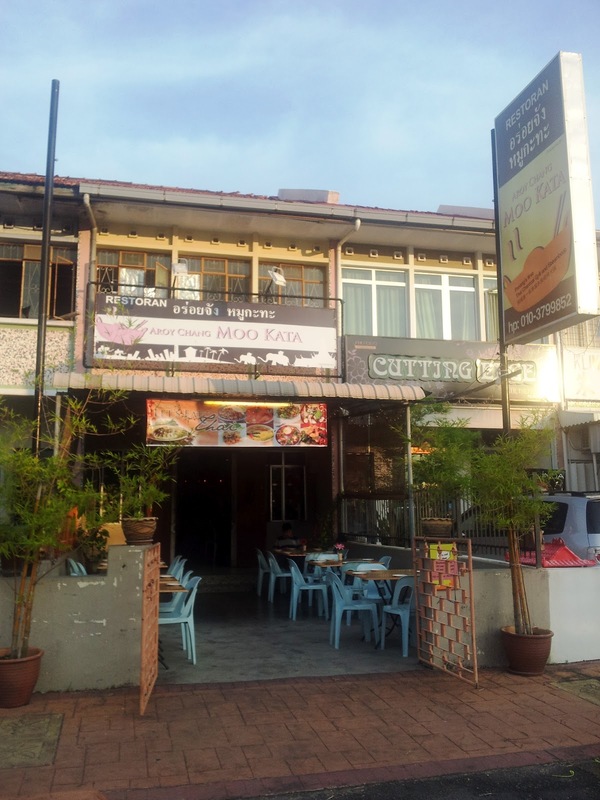 So, he suggested this place and she was happy because it's Thai food! She is sooo addicted to Thai food, I tell you. He is not very far from her also la, actually. heh. We reached there at 7pm, but the rest that were supposed to join us couldn't make it on time. And the main boy also late. HAHA. 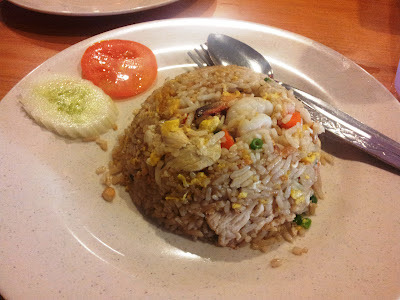 So, because we were toooo hungry, we decided to order a plate of Thai fried rice to share and tahan the hunger first. We thought we were gonna order dishes when the other boys come, but obviously we did not. Can I just say that this place is so awesome ah? Hehe. 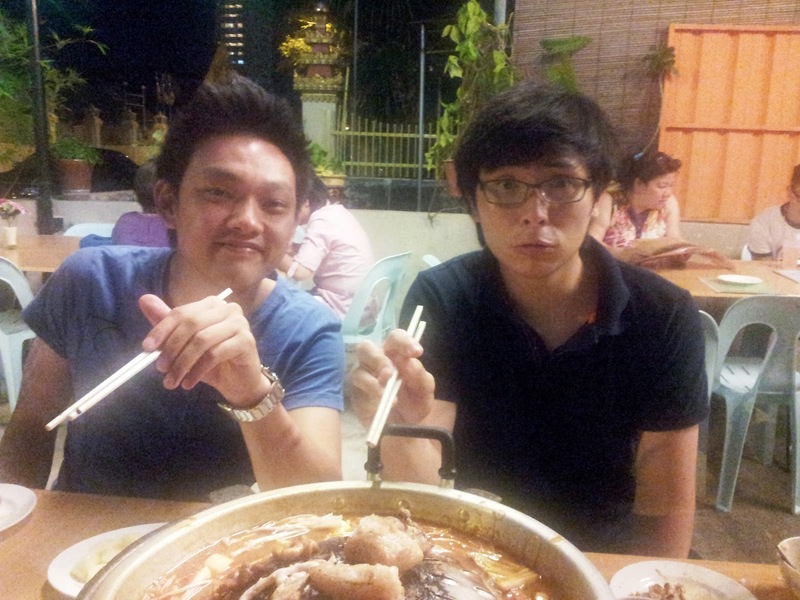 He says: A decent fried rice la, nothing special. 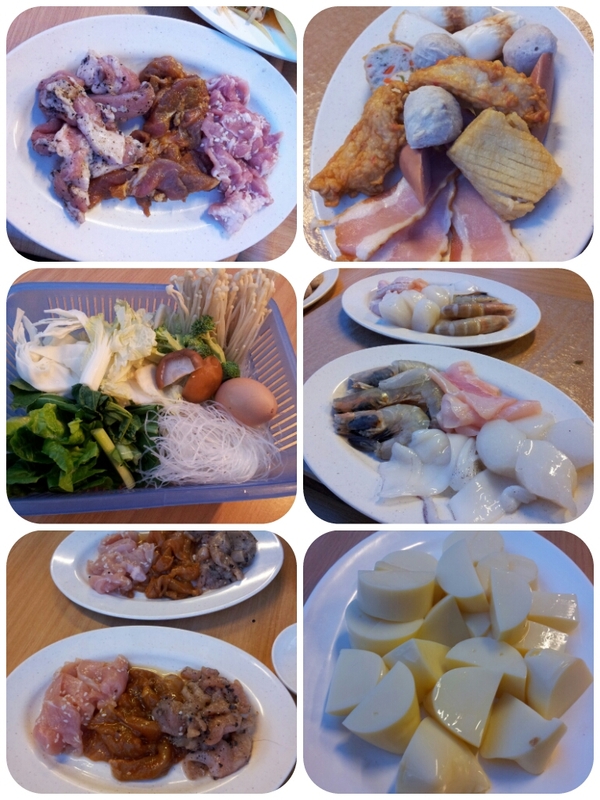 She says: I can't tell if we were too hungry that everything at that moment would taste nice or it is just a really nice plate of fried rice. But it is really nice. I like! 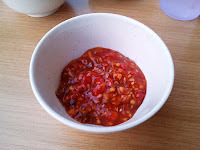 Thai sambal that came with the fried rice. He says: No comments. Me no eat sambal. ﻿So, what did we eat here? We ordered Barbeque Steamboat, Thai's style. Yes, it is pretty different than the normal ones that we have. Everything that you gonna see are included in the set that we ordered. Feast your eyes on some of the pictures we took that night! 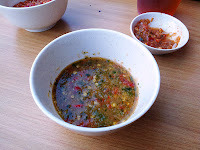 The sause to accompany the steamboat. She says: I like the green one better. But the red one isn't bad also. Josh says: *no comment because he didn't try* He called himself a bad food taster. Haha. Gary says: i. sambal. ii. 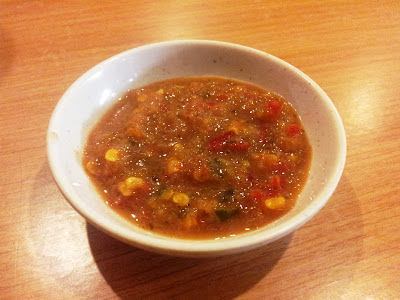 sweet and sour spicy sauce. COMBINE BOTH TOGETHER! Definitely a must DIP for all of yur food, you won't regret! She says: Love this one. Not too sour and very spicyy! Just the way I like itt! Josh says: It was nice. Spicy and sour at the same time. Josh says: It's chicken! It's always good! Gary says: The other 'appetizer' and I really enjoyed it this time! 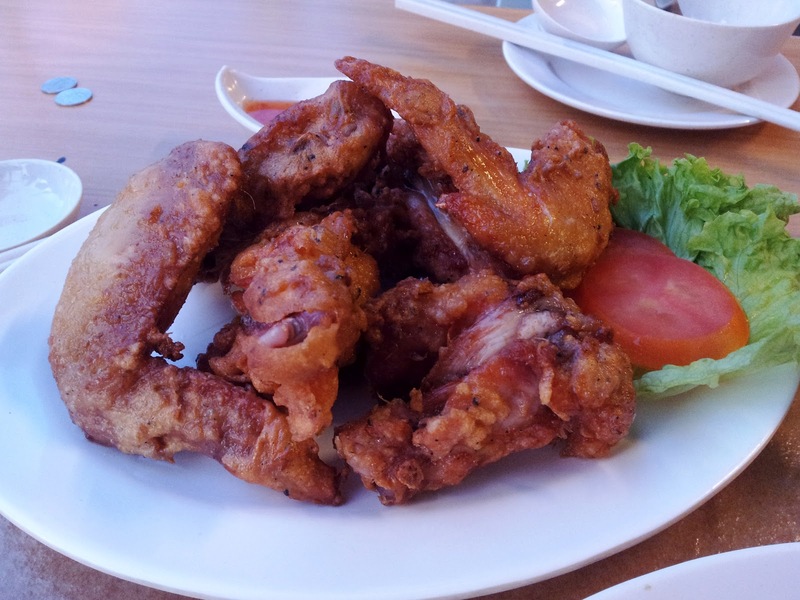 I'm known for my 'special chicken wing consumption, serious! Haha. Nothing extraordinary, but expectation met. She says: I've always liked Thai's style steamboat. I love this place. 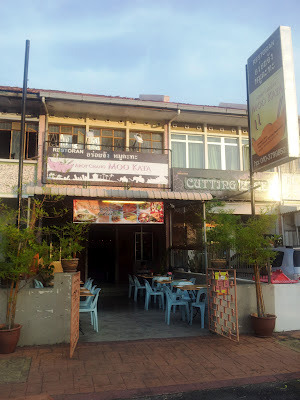 Definitely in my list of favourite Thai Restaurant in Penang. Sumore can just sit down and slowly enjoy the meal. The shop's location is very quiet and calm, sort of. Josh says: Overall, it was okay! Soup not that great. Gary says: POWER!! This is what we went there for. Tomyam soup was marvelous. Spicy, sweet, sour, sweat and tears! Eating it with glass noodles made it perfect for the night. 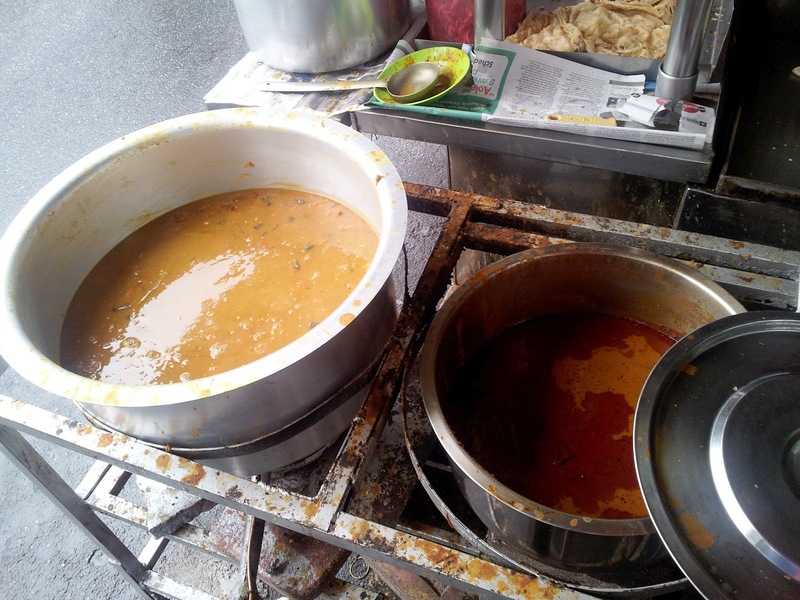 Don't forget to keep refilling the soup as it will turn sour once it the soup thickens. The staff will help but just take note! BBQ wasn't too bad. 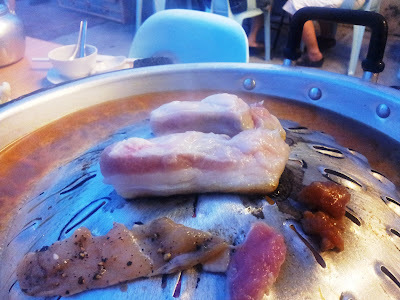 The meats were seasoned with sesame seeds and others (which I can't recall). Don't forget to dip them into the 2 sauces before you feed it to your tummy! He says: Yucks. 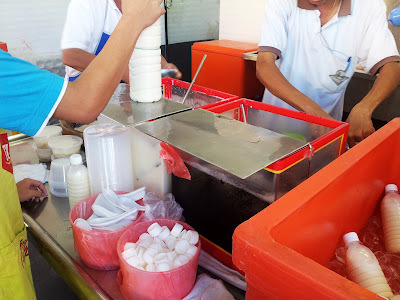 The Thab thim krop is totally different from any other stalls out there! She says: THE MOST DISGUSTING DESSERT I HAVE EVER TASTED. no kidding. yucck. Why they wanna add rose syrup into it? BIGGEST MISTAKE EVER. Josh says: I didn't have the dessert since they said not nice. lol. Gary says: HAHA! Who ordered this?!? I never had the real Thab Thim Krob before but thi tasted like Dutch Lady Strawberry Milk, the one with our very own Miss Pandelela as the ambassador. I think this was the only stuff on the table that had us struggling to finish. 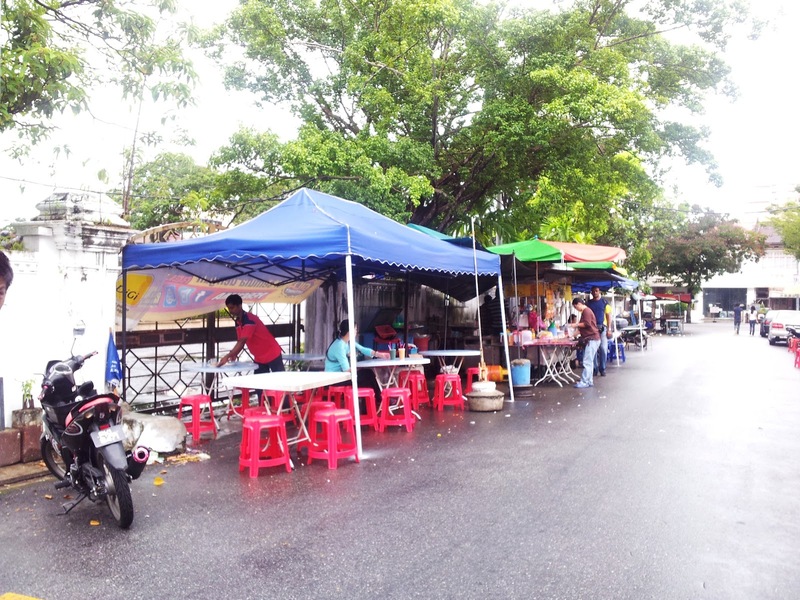 Direction: Opposite the ever famous Thai Temple in Penang, Wat Chaiyamangkalaram. One way street. The photo is taken while standing right in front of the shop. It's only ten days away before we start drawing lots for the three blessed winners! So, hurry and 'Follow 'This Blog' if you haven't do so! 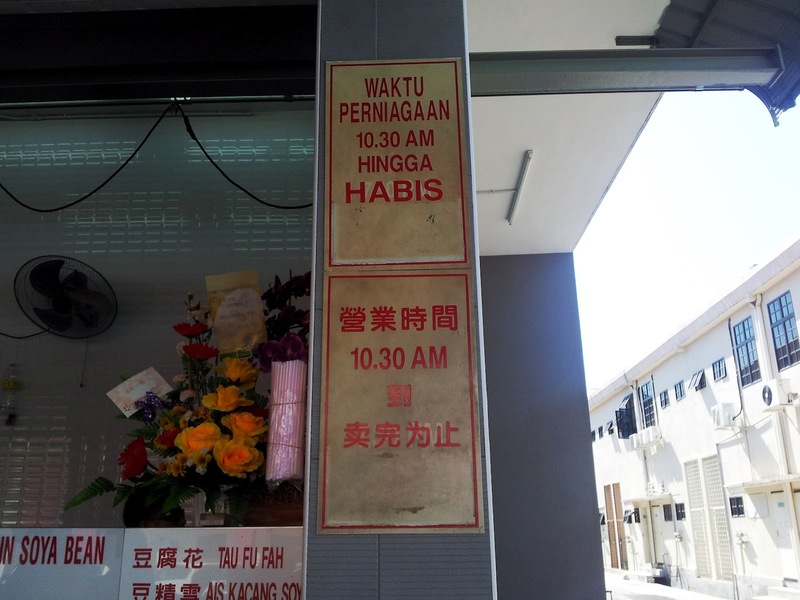 I honestly love how Malaysia is. Can just drive anywhere. 45 minutes and you will find yourself surrounded with all the awesome food in Nibong Tebal like their pork noodles, crab porridge, ice blended peanut, dry hokkien mee and laksa! And then, 2 hours to Ipoh! And that's where we were last week. Boy, was it awesome. Such amazing time to get away from the island for few hours and bond with our buddies! 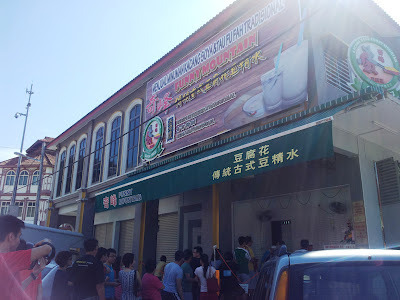 Anyways, other than the usual dim sum breakfast that's famous in Ipoh, our friends brought us to this place after brekkie. Perfect on a sunny day, especially. 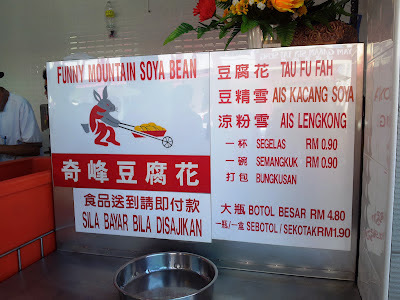 yes, soya bean drink and the tau foo fah a.k.a. 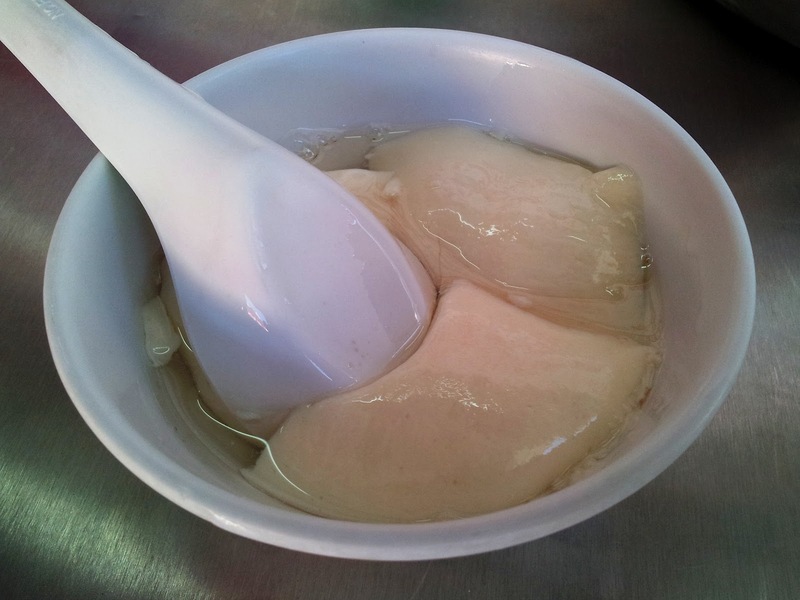 soya bean curd. It's apparently that the line is always this long or longer. Soya bean, soya bean curd and grass jelly drink. They even sell by bottles. He says: Tao hua! One quite a big fan of tua huas! 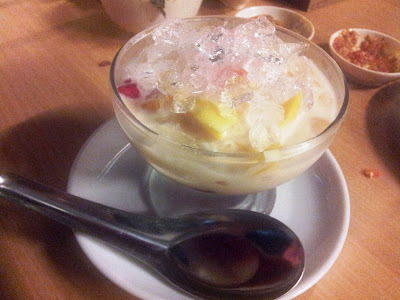 =D I gotta say this place's tai hua is really smooth. Unfortunately, the portion is super small. haha. However, I think Penang has a lot of tao hua as good as this. She says: It is really smooth and soft, just like what we've been told. But to say it's SUPER nice, I won't say so. Soya bean and Michael Jackson (because it's half black and half white!) Hahaha. 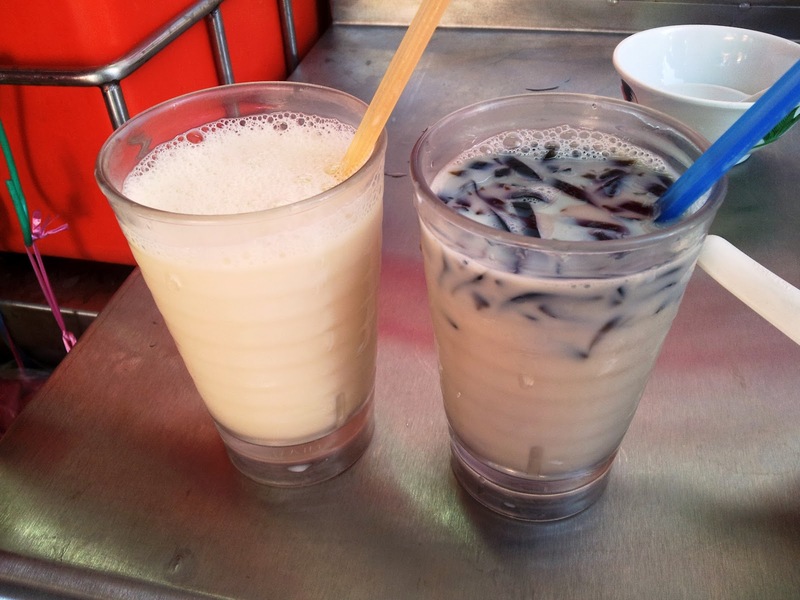 It's mixture of soya bean and grass jelly. She says: This one me no like. I prefer the mixed one. There's hardly any taste on the soya bean drink. It's like so blahh. Funny Mountain Soya Bean has a picture of a rabbit in red pushing a trolley with stuff? 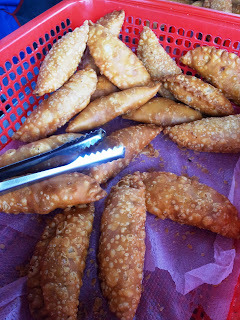 Hmm..
﻿We are back with more snacks! 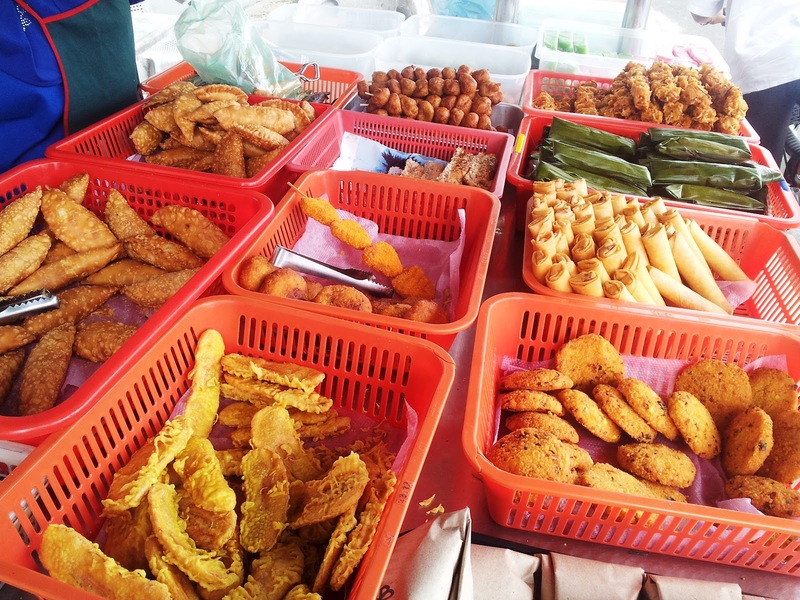 Sometimes in the noon (being a typical Penang person), we would crave for laksa, or ice kacang, or banana leaf rice, or pasembur, or rojak, or kuih-muihs, and sometimes we crave for karipap (aka curry puff, Malaysian style). 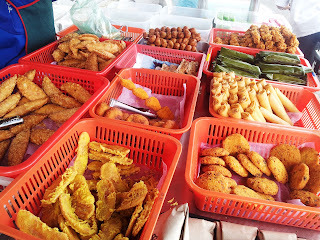 And because these little cravings are indeed very important, we would drive all the way up north to Tanjung Tokong just to get our hands on the ever yummy karipap that's by the road side. 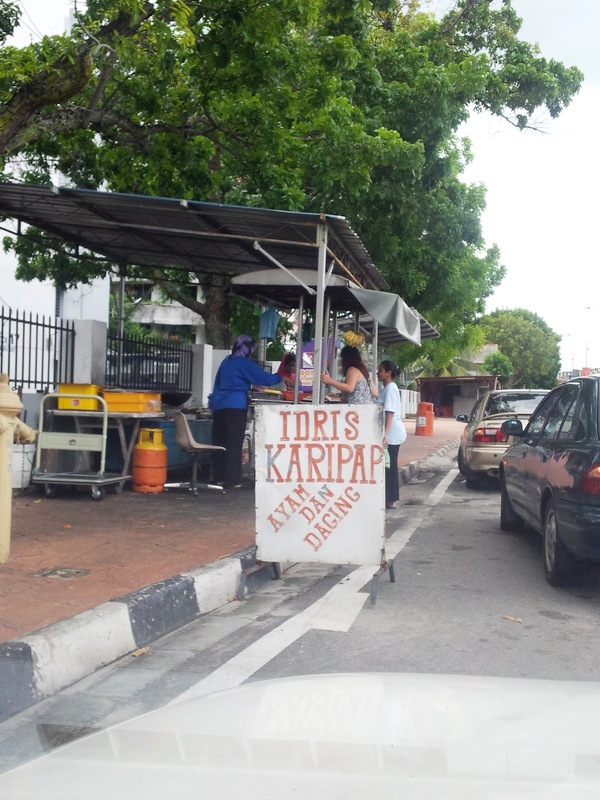 Direction: The stall is located slightly after Island Plaza's traffic light. 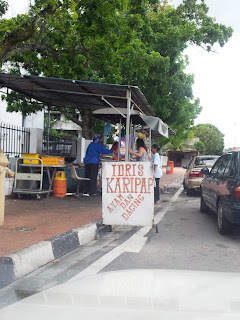 If you are coming from Gurney Plaza, after the Island Plaza's traffic light, it will be on your left.